Many of us long to hear God's voice, yet we often overlook the great wisdom God gave us in our bodies. There is a deep connection between our bodies and spirits. What might happen if we listened more deeply to the wisdom of our bodies? How might listening with our whole selves change the way we listen to God? Listening to God with the entire body, not simply with our ears, may seem like a strange concept. Yet God created the body and the breath as gifts for us to explore. Most important, we don't have to experience a crisis to learn to listen to God's activity in and around us. Each of us can slow down and listen for God just as we are—in breath, body, and spirit. 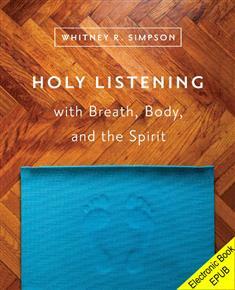 This 40-day guide to holy listening offers daily meditations that can be completed in as little as 30 minutes. Each meditation includes scripture, yoga postures, a breath prayer, suggested essential oils, and reflection questions. The book provides descriptions and simple illustrations of yoga poses and suggests seated poses as modifications for all poses, making it accessible to both experienced yoga practitioners and those new to yoga. Allow this book to invite you on a journey of holy listening as you explore ancient tools and new ways of experiencing the presence of God.